One day I imagine that I’ll be rocking on my front porch, sipping a beverage while contemplating whether our current home is too large for empty nesters. But that day is not here yet. For now, we are living in our townhome – the one that we were supposed to have upgraded from four or five years ago right as the housing bubble burst. Things changed, we stayed, we had two kids. We do have enough space, but it requires constant attention, organizing, and reorganizing. Especially after Christmas and birthdays. Here are a few tips to keep the toys under control. Next, box up some of those toys – even the new ones! This is actually helpful even if you aren’t limited on space – I’ve noticed that when there are too many toys out and it’s chaotic, my daughter just dumps every single toy on the floor and then asks for a banana and an episode of Super Why. Fewer toys results in more actual playing, at least in our experience. 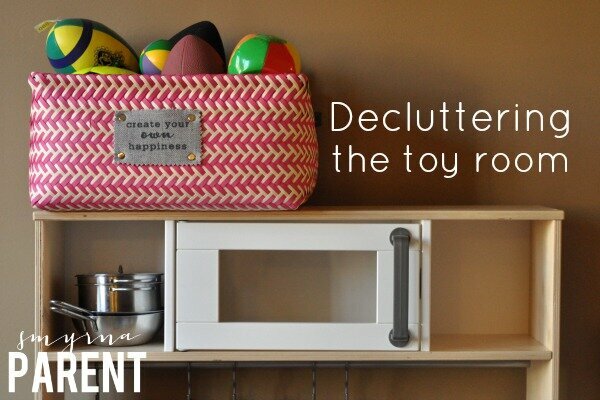 Get some large storage bins and load them up with toys until the play area is manageable. Make sure you label what’s in each one and then take them out to the garage, or attic, or storage closet. Then bring those toys back 3-4 weeks later and reload your bins with some of the older toys. If your child notices and asks for a certain toy, by all means, bring it back, but I’ve found that the novelty of the “new” toys is a big enough distraction – and it keeps the thrill of new toys for the kids week after week. Hanging shelves, hanging net storage for toys and balls, tall shelving units. When the floor starts to look a mess, look up. Bins, boxes and baskets keep small pieces together and allow you to organize the play area into categories – ball basket, doll bin, train box, etc. It also makes it easy for even little kids to help clean up. They don’t have to be boring plastic storage bins, either. I’ve been impressed with the very inexpensive but decorative options at stores like TJ Maxx and Marshalls. How do you handle the post holiday clutter?